Clear glass balconies from Balcony Systems are now even ‘greener’ thanks to the innovative self-cleaning glass coating that eliminates the use of strong chemicals to keep them clean. Factory-applied to both sides of the glass, the patented coating creates a super-smooth surface that repels water, dirt and grime more quickly to reduce the cleaning cycle by around 90%. Instead of harsh chemicals, a wipe down with a wet cloth is all that’s needed. Available across its entire range of glass and aluminium balustrading, glass Juliet balconies, and curved sliding patio doors, the self-cleaning glass coating is an important element of Balcony’s Green Policy in contributing to the company’s environmental credentials and reducing the carbon footprint of its products. “Our special coating has three major advantages; it gives glass added impact resistance, protection from the elements, and dramatically reduces regular cleaning,” explained Effi Wolff, Balcony Systems managing director. “Over time, the microscopic ‘peaks’ and ‘valleys’ on the surface of untreated glass traps dirt particles, which cannot be removed – even by strong chemical cleaning agents. That’s why, over time, glass discolours and becomes more opaque. Our coating evens out the surface so nothing can stick and keeps the glass cleaner, while also helping to prolong its lifespan. BASF’s Basotect melamine foam is in use for insulating the Gobi line of solar flat plate collectors by Heliodyne, Richmond, California, one of the oldest and largest manufacturers of solar collectors in the US. The Gobi line is Heliodyne’s flagship product that has continuously been refined and optimized for over 30 years. Heliodyne chose insulating Basotect parts, custom cut by the thermal and acoustic composite manufacturer Polymer Technologies of Newark, Delaware, to line the back and the sides of their collectors. The BASF foam shows excellent insulation capabilities as well as long-term, high temperature resistance. Flat plate solar collectors use solar energy to produce hot water for residential and commercial buildings. Water or heat transfer fluid is heated as it passes through panels that are designed to collect heat from the sun. One essential aspect of the collector design is the thermal insulation that is used to retain the heat in the collector. Solar collectors that are stagnant, meaning that the liquid is not flowing through the collector, can reach temperatures that exceed 175ºC. Basotect can withstand these temperatures unlike other polymeric foam insulating materials that usually start to degrade at considerably lower temperatures. Heliodyne uses Basotect on three different sized flat plate collectors so that the optimal design can be found for both residential and commercial customers. The panels were tested and certified by the Solar Ratings and Certification Corporation (SRCC). Bowater Building Products has won its third consecutive Green Apple Environment Award in the national campaign for find Britain’s greenest companies, councils and communities. The 2011 award is for the company’s revolutionary specification and residential product System10 Aluminium. In 2009 the award was for Bowater's unique thermal inserts – which slide into outer window frame profile and allow higher WERs to be achieved in a simple, cost effective way and, in 2010, for SmartSash, a system that enables PVCU doors and windows to be fitted now to currently comply with the Code for Sustainable Homes (CSH) Levels 3, 4 or 5 – and then be simply, easily and inexpensively upgraded to Level 6 standard at a later date. The awards are awarded annually by the Green Organisation, an independent, non-political, non-profit organisation, to recognise those companies whose products enhance the environment and promote sustainability. System10 Aluminium is an innovative, quality-engineered system that, for all exterior and aesthetic purposes, resembles an aluminium window in terms of the associated sightlines, performance and finishes. In that respect, it fully satisfies the design demands of specifiers; yet it exceeds the installation and maintenance criteria of ‘traditional’ products and delivers energy efficiency benefits way beyond those previously experienced. Such is the high performance of the system that the System10 Aluminium Window achieves levels three to six (essentially future-proofing it) of the Code for Sustainable Homes with an unbeatable – for aluminium – U-value of up to 0.7 W/m2K. While the window looks like aluminium and feels like aluminium; the ‘core’ interior of the aluminium structure has been entirely replaced with an isomeric thermoplastic endoskeleton that enhances thermal performance, reduces material costs, and makes fabrication and supply easier and much less expensive. While satisfying specifier requirements, the System10 Aluminium system will also enable non-aluminium fabricators to compete in this sector; and simultaneously allow aluminium fabricators to broaden their ranges with a higher performance, lower cost product. 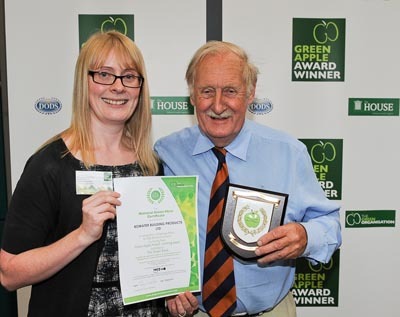 Picture: Claire Venthen, sustainability manager, Bowater Building Products and inventor Trevor Baylis. 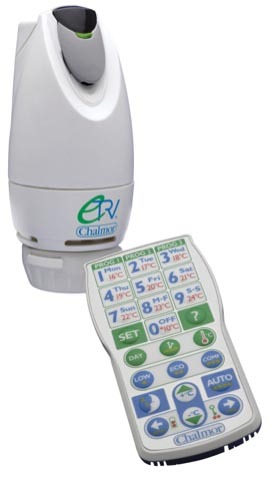 A new energy saving electronic thermostatic radiator valve – the eTRV from Chalmor – will be demonstrated at Govtoday Carbon Reduction 2011: The Transition to a Low Carbon Economy on 29th November in London. Delegates at this Third Annual National Summit at The Brewery, City of London, will see how the eTRV has the potential to save both commercial and domestic users up to 25% on their heating bills. Carbon Reduction 2011 focuses this year on new schemes and policies to be introduced by the Government to build a green economy for the future. A recent trial at Bristol University’s student halls of residence has led to savings of around 30% on heating costs, according to the University’s sustainability manager (Energy), Chris Jones. The eTRVs were part of a refurbishment of the 53-room building, The Hawthorns. 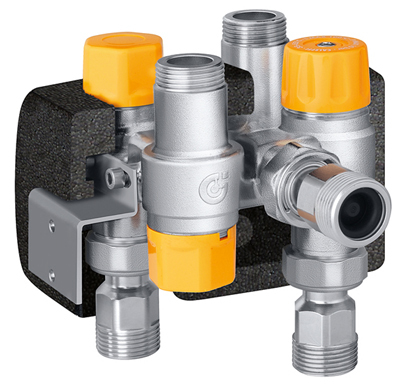 These British-made programmable valves from Chalmor have inbuilt features that provide full and individual heating control in both refurbishment and new build systems with no need for the high cost and investment of whole building management systems. Bristol University’s next project that will incorporate the electronic thermostatic radiator valves is the updating of 204 student rooms at Churchill and Wills halls. The second phase of development at Homeline Building Products’ in-house, mixing plant has begun. Homeline’s investment is designed to increase the factory’s output, inline with the ever-increasing popularity and strong growth of its PVC-U product range. Phase 2 will provide additional manufacturing functions including the facility to mix skin grade and rigid PVC for its extensive collection of rooflines and cladding. Phase 2 will enhance Homeline’s environmentally responsible manufacturing processes; Homeline recently introduced ‘Core’, a new range of recycled roofline, already BBA approved. 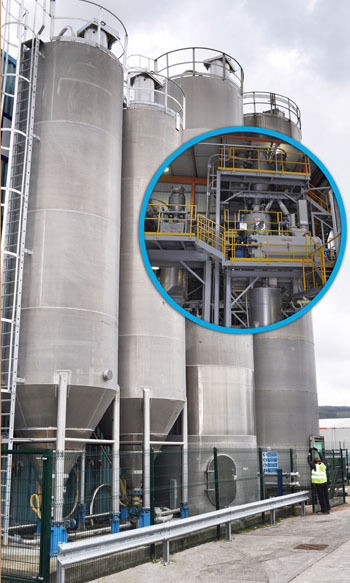 Julian Allen, group manufacturing manager said: “It has always been our firm intention to continue to build on the success that Phase 1 of the in-house mixing plant has delivered. Phase 1 gave us the capability, capacity and technical expertise to mix our own cellular foam formulation, and remove harmful lead and tin stabilisers from the manufacturing process. Phase 2 will now allow Homeline to go even further by allowing us produce ‘Core’ the industry’s first BBA approved recycled roofline suitable for both the domestic and commercial markets. Insight Data has opened up new opportunities for suppliers in the commercial and new-build sector by launching a comprehensive database of major building companies in the UK. The ‘Construction File’ has detailed information on more than 4,900 decision makers in 1,400 of the UK’s largest construction firms, including property developers, house builders, main contractors and property maintenance companies. “The construction industry has seen unprecedented re-alignment in the last three years with companies such as Connaught PLC and ROK folding, while many others have restructured, merged or changed sectors/strategy. The number of decision-makers and senior executives who have changed positions is also astonishing,” explained David Lewis, Insight’s Data Analyst. This is creating a headache for building product suppliers, service providers and the thousands of other companies who supply large construction firms, as the relationships they have built over a number of years are disappearing. “The market has certainly seen decline, but the companies on the Construction File are still purchasing hundreds of millions of pounds in products and services every year. Unfortunately many suppliers are wasting a huge amount of time, money and resources promoting their company or products to decision makers who have long gone, or to organisations that have ceased trading, merged with someone else or changed sectors, and all that effort is simply ending up in the bin,” David said. Detecting compound spots and contamination on surfaces right after the printing process, before cell firing, is essential in order to produce A-level solar cells. Isra Solar Vision offers a defect inspection system for compound spots on cell edges, which will cause short-circuits when the cells enter the flashing process. Inspection at this stage helps to ensure level A quality for at least the next 400 cells. The new Solarscan-Bevel system prevents to manufacture scrap and gives the possibility to react immediately with protective or maintenance actions. The major benefits: solar cells with best-in-class optical quality and reduced machine downtime. To optimise production efficiency, to increase machine uptimes and to reduce manufacturing costs, one major goal is to detect defects such as contamination and unclean coating in the manufacturing process as early and as fast as possible. Solarscan-Bevel inspects the cells after printing before firing. This enables manufacturers to clear compound spots on cell edges that could lead to short-circuits in all following cells. The additional benefit: the reliable inspection alarms the maintenance staff and signalizes that aged meshes have to be exchanged. Cell edges are the most critical areas for compound spots because the pressure exerted on the mesh is extremely high. Isra Solar Vision provides the optimum solution for this problem with its new inspection system especially designed for the early detection of edge defects such as contamination or spots. Being applied in every production line right after printing and before the firing process, Solarscan-Bevel enables the manufacturers to optimize their process and to avoid non-reparable defects. The huge advantage: material with short-circuits will not reach higher processing steps, hundreds of defective cells can be avoided and resources will be saved. 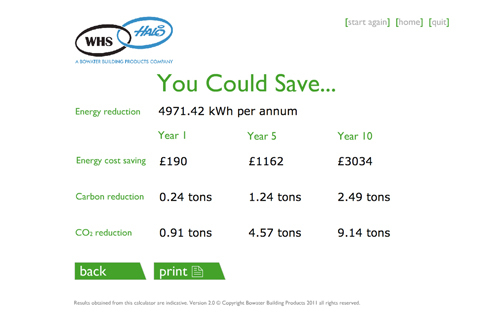 WHS Halo has enhanced its online energy savings calculator so that it now works on the basis of not only Window Energy Ratings, but U-values too. The Energy Savings Calculator (ESC) works through a set of seven simple questions to demonstrate not only the potential savings in terms of energy bills over one, five and 10 years but also gives figures for carbon and CO2 reductions. The original ESC worked on the basis of WER ratings and showed the benefits of PVC-U windows to homeowners. Now the latest version can be used to demonstrate the potential financial and CO2 savings that new energy efficient replacement windows will provide for commercial buildings to architects and specifiers more familiar with U-values. This marketing tool can also be supplied on CD for use on sits and in show rooms or can be rebranded by WHS Halo's in house marketing services team with the fabricators’ or installers’ logo and corporate style into their own website. Altecnic, supplier of plumbing equipment, has seen demand soar for its solar-specific components and kits, after showcasing the units at the successful Renewables Roadshows during September. At each of the six roadshows, the company said installers were impressed with Altecnic’s simple-to-fit solar storage-to-boiler connection kit, designed to seamlessly integrate a solar storage unit with a pre-existing combination boiler. The accredited 263 connection kit links the boiler to the solar application, drawing free hot water from a cylinder if it is over 40°C, effectively transforming the boiler into an ultra energy efficient system. Focusing on accreditation and legislation, OEM’s, building contractors and plumbing merchants attending the shows were keen to learn about Altecnic’s 5218 tempering valve for solar hot water systems, which is the first and only one in the UK to be independently verified as complying with the revised UK Building Regulations Part G 2010. Accredited to BS EN 15092 and approved by BuildCert’s Distribution Tempering Control (DTC) Scheme, the valve must be fitted to any storage vessel capable of exceeding 80°C. Tinuvin 1600 from BASF is a UV absorber which provides extremely long-lasting UV protection to high-performance thermoplastics, including those used in photovoltaic panels. It exhibits excellent UV absorption capacity resulting in minimal loss of optical properties for stringent weathering requirements. Very low volatility allows excellent processing characteristics. BASF claims that Tinuvin 1600 sets a new industry benchmark in ultra-high durability which cannot be achieved with current UV technologies. Tinuvin 1600 has been specifically developed for the long-lasting protection of thin layer applications for exterior uses, allowing plastic sheets, films and fibers to retain their mechanical properties, color and transparency for extended periods of time. It belongs to the class of triazines and exhibits very low volatility, excellent thermal stability and good substrate compatibility in a variety of polymeric resins, which allows very easy processing. It imparts far superior durability that traditional UV absorbers of other chromophore classes cannot achieve. Tinuvin 1600 is recommended for: monolithic and multi-wall PC sheets for ultra-high-durability architectural and automotive glazing applications; biaxially oriented PET films for photovoltaics, window films, displays, protective films and other long-term applications; PMMA laminations for very durable specialty applications like window profiles, photovoltaics and demanding construction applications; PET and PA fibers; SAN, ASA high-performance plastics applications, eg, in building and construction and automotive applications; and other extruded or blown thin-film applications requiring extended UV protection. Celotex has received approval from Ofgem (Office of the Gas and Electricity Markets), recognising that the company’s range of PIR insulation meets the strictest levels of energy efficiency. The Ofgem approval confirms that Celotex’s range of products that can be used in accordance with government carbon reduction schemes such as Carbon Emissions Reduction Target (CERT) and Community Energy Saving Programme (CESP), helping to cut UK CO2 emissions by 34% by 2020 in line with government targets as part of the Climate Change Act. “We are delighted that Celotex products have received Ofgem approval,” said Paul Evans, product manager at Celotex. “With CERT and CESP playing such a key role within the UK’s current carbon reduction programmes, Celotex’s inclusion on the Ofgem approved list is a great way to demonstrate the suitability of the company’s market leading products as a sustainable way of improving the UK’s housing stock.” Celotex PIR boards are supported by third party approvals from leading industry organisations including the BBA (British Board of Agrément), BRE and the Energy Savings Trust. Celotex recently achieved a 0.021W/mK lambda for its FR5000 and CG5000 range, complementing the 0.022W/mK lambda value of many other Celotex products. Celotex’ insulation products achieve an A+ rating when compared to the BRE Green Guide 2008 and have been independently assessed by BRE Global, through its Approved Environmental Profile, and have been confirmed as achieving a low environmental impact. Celotex is also certified to Environmental Management Standard EN ISO 14001 and has also become the first PIR insulation manufacturer to receive Energy Saving Trust Recommended Product certification. Conergy has launched its ‘Conergizer’ tool in the UK to coincide with the start of Green Building Week. The online systems planning tool helps users work out the best solar solution for any roof – aesthetically, financially and in terms of pure kilowatt power generation potential. The move is expected to enable the viability of many solar projects in the UK that have previously been discounted because buildings are not south-facing or roofs have chimneys or other obstructions, and to increase awareness of best practice solar installations. Available for free on the website, the software allows users to enter building data such as location, dimensions, roof type and obstacles (such as windows, chimneys etc.) to create an attractive 3D graphical model. A simulation of sunlight over the course of the year highlights areas of shading so solar panels can be positioned accordingly. Climatic conditions for the whole of Great Britain have been mapped, including maximum wind and snowloads, supporting decisions on what type of frames are best employed. The system then takes into account the building’s orientation and tilt of the panels in relation to the sun, as well as obstacles such as chimneys and dormer windows and local sunlight data, to accurately forecast power generation for the year. This enables detailed estimates of the end-customer’s return on investment, based on the cost and size of the installation, its feed-in-tariff, expected off-grid energy use and energy prices, and the customer’s individual financing arrangements. “One change to the design and the financial picture changes dramatically,” said Robert Goss. The KBE System 88, which was launched by Kömmerling in July, has now received the PassivHaus certification. KBE System 88 includes six chambers and an 88mm depth frame. 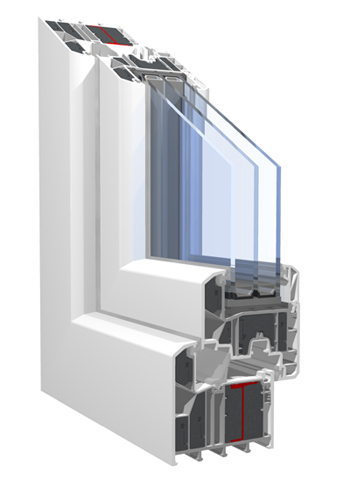 It can boast a 0.7W/(m²K) U-value, using argon gas filling in the IGU, exceeding the Passivhaus specification and is designed to include high performance triple glazing as standard. Within the system are a range of reinforcement options, including foam-coated steels and the PVCU sections are co-extruded with a Greenline lead-free skin and a full recycled internal construction. It’s available in 44 different colour options plus the option of Alustar, an aluminium cladding section designed to meet the needs of architects and offering to use the entire RAL colour spectrum. The system also takes existing and standard UK tilt and turn hardware. Since the first installations of its Rehau Awadukt Thermo ground-air heat exchanger (GAHE) took place in 2008, Rehau has been datalogging the performance of a number of the systems to gather real time data about how effective they are in pre-tempering ventilation air. Monitored projects in Germany, France, Poland and the UK all reported performance figures which exceed those predicted by Rehau’s own GAHE software. The Rehau Awadukt Thermo system operates by drawing ventilation air into a building through underground pipework grids buried at a depth of around 1.5m. 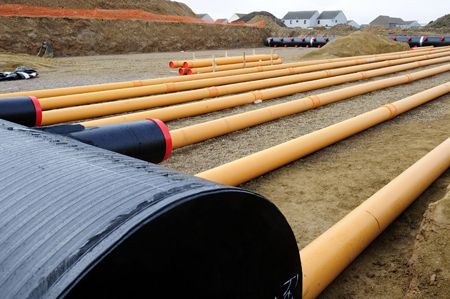 The optimised polypropylene material used for the pipes maximises heat transfer between the ground which is at a fairly constant 7ºC-13ºC and the incoming air, with the result that the air can be pre-warmed in winter by as much as 9ºC and pre-cooled in summer by up to 14ºC. A low energy cooling system suitable for Passivhaus projects, Rehau has demonstrated that Awadukt Thermo can achieve a coefficient of performance up to 20 for commercial projects and 50 for residential applications. In the UK, the monitored installation was in a domestic property linked to a MVHR system for optimum performance. Sensors were installed in the air inlet tower to measure incoming air and just ahead of the MVHR unit upstairs and have recorded reductions in summer air temperatures of 12ºC and an 18ºC increase in winter. AGC Glass Europe has claimed to have become the first glass maker to obtain the ‘Cradle to Cradle’ eco-certification, achieving the silver level for its float glass and magnetron-coated glass products. 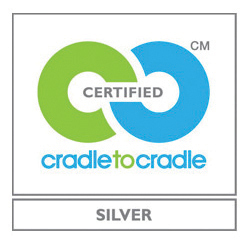 As the name implies, ‘Cradle to Cradle’ (C2C) certification indicates that any materials used to make a product are either biodegradable or can be recycled at the end of the product’s working life, as well as being non-toxic. This principle is just one of AGC’s environmental policies and complements the company’s other green commitments, such as making efficient use of energy and water and pursuing a strategy of corporate social responsibility. 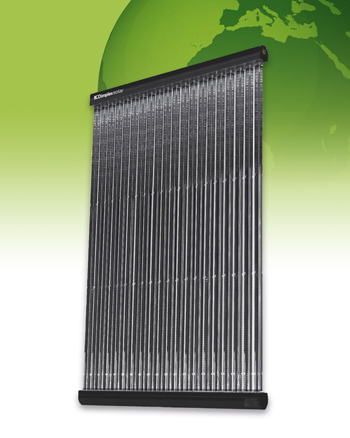 Dimplex is adding a high efficiency evacuated tube solar collector to its solar thermal water heating range. The new direct flow collectors offer highly efficient generation of hot water for domestic and commercial applications and have been specifically designed to give excellent performance year round in the more challenging northern European climates, delivering excellent transfer of solar energy to heat, thanks to a vacuum incorporated inside the tubes to insulate against heat loss caused by cold, wet and windy weather. Available in a choice of 20 or 30 tube options, the system is quick and easy to install and can be mounted horizontally, vertically, or on flat roofs and facades. Plug-in tube connection allows for quick installation, easy replacements and standard tube spacing – even with multiple collectors or manifolds. For added ease of installation, the tubes can be rotated once in position to achieve the optimal alignment. Dimplex’s evacuated tube solar collectors are solar keymark approved, meaning that they will be eligible for the financial incentives available under the Renewable Heat Incentive, available to non-domestic installations from October this year, with domestic installations expected to be eligible from October 2012. The new evacuated tube collectors come with a 10-year guarantee. 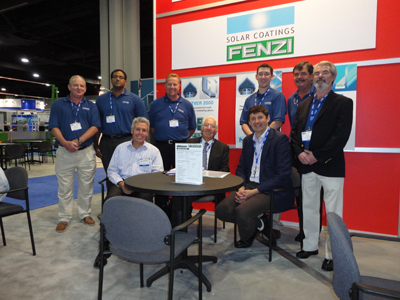 Duralux Solar Coatings, the new range of solar mirror coatings by the Fenzi Group, won the attention of visitors at the recent GlassBuild America 2011. According to the most recent assessments, the solar products industry is leading the North American continent in the area of jobs growth. The outlook for the future confirms this trend, in light of the explosion in global demand for solar energy products expected during the five-year period from 2009 to 2013. The range of Duralux Solar Coatings was developed and tested by the Fenzi laboratories to meet the highest standards of durability and strength. Features that are vital in order to maximize the advantages of this kind of technology. These coatings have been developed to ensure extraordinary chemical resistance to corrosion and UV radiation, the best performance when exposed to thermal and environmental stress and optimal resistance to abrasion. 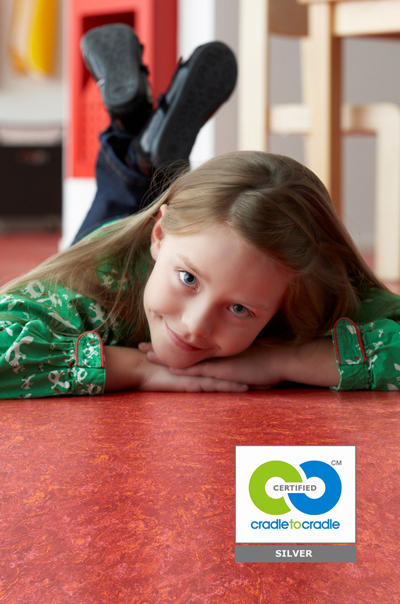 Tarkett has been awarded the Cradle to Cradle Silver Certificate for its Linoleum product range. Made from materials such as linseed oil, pine resin, jute, wood and cork flour, linoleum is the ultimate natural and renewable product. The Cradle to Cradle certification is based on: material content; material reutilisation and design for the environment; use of renewable energy and water stewardship during the production process; and social responsibility principles. The certification process looks at the chemical components of ingredients that go into a product, assessing their effects on human and environmental health, as well as their ability to be recycled or composted. The Silver Certificate means that all the ingredients used for Tarkett Linoleum are identifed and positively assessed. For the production process, energy and water use were characterised and water stewardship guidelines were signed based on Cradle to Cradle criteria. As an example, at Tarkett’s linoleum production plant in Narni, Italy, a closed loop water system is used for process cooling and the factory has also committed to increase its use of renewable energies. Tarkett is committed to the UN Global Compact 10 principles for social responsibility and has published a code of ethics and integrated the Global Compact into procurement contracts. At the start of 2011, Tarkett signed a partnership with the German scientific institute EPEA (Environmental Protection and Encouragement Agency) to deploy the Cradle to Cradle concept. 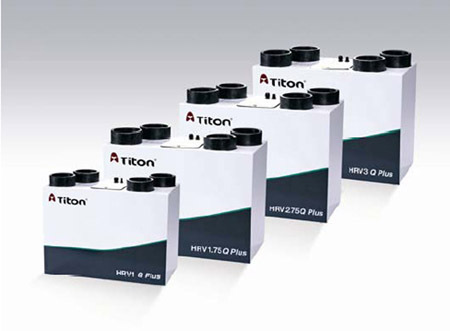 Titon’s energy efficient heat recovery ventilation units now include six robust models; the HRV1 Q Plus, HRV1.5 Q Plus, HRV1.75 Q Plus, HRV2 Q Plus, HRV2.75 Q Plus and the HRV3 Q Plus. Designed to meet the requirements of the Building Regulations in England and Wales, the range offers specifiers and housebuilders flexibility and reliability when considering how best to ventilate and protect the building and the long term well‐being of end users. All Titon whole house ventilation units (with heat recovery) have been independently tested by the BRE and are EST Best Practice compliant. The range is also compatible with System 4, to help comply with Part F of the Building Regulations 2010. The combination of very low power consumption and a highly efficient heat exchanger is specifically designed to enhance SAP performance via Appendix Q. All models are fitted with incredibly quiet and very energy efficient fans. As standard, all models in the range are fitted with an ‘intelligent’ controller. The controller features a sophisticated frost protection system and summer mode. A Summerboost option is also available in all units, (except the HRV1 Q Plus) to help reduce susceptibility to the overheating of dwellings in the summer months. Optional extras include an intelligent 100% summer bypass, a switch activated option which turns off, or reduces supply, when windows or trickle vents are opened. Tyco Fire Protection Products has launched Kwikstrut metal framing and supports for photovoltaic (PV) and solar panel applications. The new Kwikstrut supports can be fitted quicker than traditional mountings, reducing time and manpower required on site. The bolts, nuts and washers in the fittings are pre-assembled and lightweight and can be fitted single-handedly. Kwikstrut fittings have been developed for use in a variety of locations to suit different requirements, such as large solar fields or on industrial sites. The framing and supports are corrosion resistant and can withstand snow, wind, and high and low temperatures. The Kwikstrut support system is completely flexible, allowing for custom designed solutions to suit each individual project. The system requires no welding, and the frames and mounts can be disassembled and reassembled quickly and easily if required. Tyco provides CAD software services to custom design each project and meet industry standards. The technical design service provides comprehensive customised solutions, including easy-to-follow isometric drawings, as well as wind and snow load calculations to DIN standards. The new Kwikstrut framing and supports have been developed in response to market growth in the renewable energy industries across Europe, the Middle East and North Africa. Installers across the UK are using all kinds of makeshift methods of lifting solar panels onto roofs and this is dangerous. 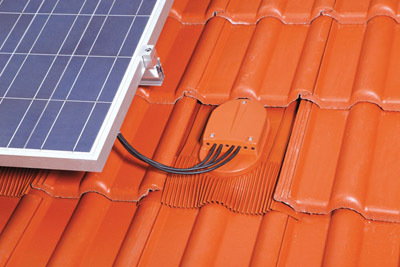 Lifting a solar panel onto a roof is a precarious task and without a safe method of lifting them breakages can happen. Replacing just one solar panel stops the whole installation. Commissioning and payment has to be put on hold until a replacement panel is sourced. A solar panel might be robust enough to take the odd bump or knock without damage but job sites can be dangerous and unpredictable places, and accidents do happen. So it’s very important to be careful when handling fragile solar panels. 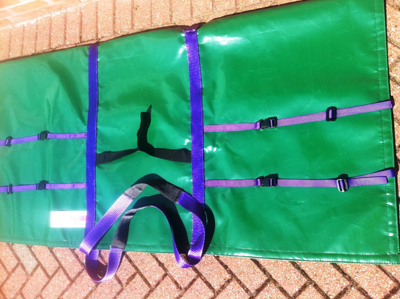 The solar lifting bag has been developed, produced and certified in the UK, by inventor Andy Proctor. The bags cost £259+vat including delivery with discounts for bulk purchases. All bags are hand made to order in Suffolk within seven days and delivery by a 1-2 day courier. They can be delivered to anywhere on the UK mainland and are available in blue, green or red. • Rugged outer skin to make them more robust to use on-site. 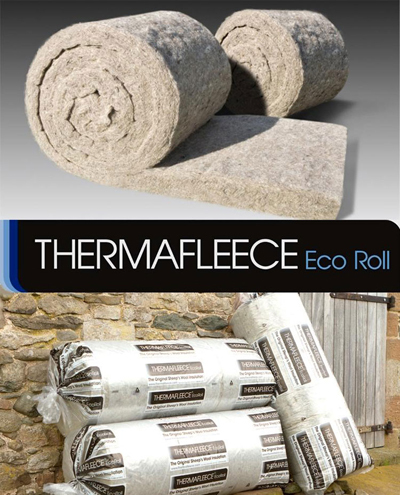 Second Nature UK has developed and launched its latest product – Thermafleece EcoRoll – a compress packed wool insulation that is easy to handle and quick to install. • 20%.more wool compared to our existing roll. • 35% less packaging weight per m2. • 20% more insulating material per pack meaning 20% less transport impacts to site as well as 20% less packs to handle and store. • cost is reduced by 10%. Available in widths of 370mm & 570mm and thicknesses from 50mm to 140mm and also available in slabs. Insulating with this product EcoRoll can result in energy savings greater than £150 per year meaning that the insulation pays for itself in just a few years. Warmroom is a magnetic energy saving product that reduces heat loss and energy bills. The magnetic foil is attached to the back of radiators and reduces the amount of heat escaping through walls by up to 60%. At just 1mm thick, Warmroom is invisible once in place and will instantly reduce the wall temperature behind the radiator thanks to its special laminated foil. Developed by Anchor Magnets of Sheffield, packs of Warmroom contain six sheets at 500mm x 200mm which will deal with heat loss from an average sized radiator. In tests conducted by the University of Sheffield, the temperature of an uninsulated brick wall behind a hot radiator was recorded at 45ºC. After fitting Warmroom panels to the back of the radiator the wall temperature dropped to 25ºC. The product also saves around 18kg of CO2/m2 per year, enabling householders to reduce their carbon footprint at the same time as lowering their utility bills. 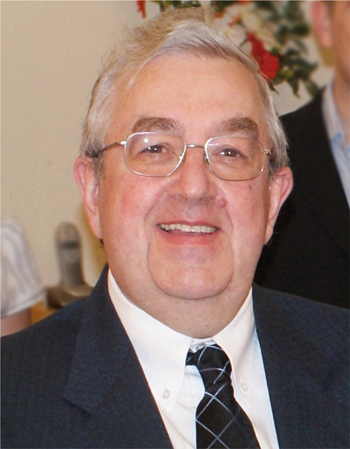 Mike Burton, Anchor Magnets sales director and inventor of the product, said: “Warmroom is such a simple solution – ideal for householders and tenants everywhere. The colder it is outside, the better the product works and it is really effective in preventing heat loss in houses, schools, hospitals, offices – in fact any building heated by steel radiators mounted on outside walls. Warmroom was trialled last winter for between four and eight weeks among tenants of South Yorkshire Housing Association, university representatives and employees of National Energy Action. All reported how quick and easy it was to fit with the majority concluding that the product made their rooms noticeably warmer. Several householders also reported lower heating bills following the trial. Warmroom is available to buy online and costs £9.95 per pack. One of the easiest ways to reduce the amount of water used at home is by fitting the new flow regulator accessory from Crosswater, into any of the 33 basin tap collections or shower hoses to control the amount of tap water used. Taps can use more than 10 litres of water per minute. By leaving a tap running while you are cleaning your teeth can waste about nine litres of water a minute (Defra). For a quick and eco efficient bathroom update that costs just an additional £4.50, install the latest technologically advanced flow regulator to efficiently save both a huge amount of water and money, while also guaranteeing even water distribution. The flow regulator technology keeps the flow rate constant across the pressure. Flow regulators are used to maintain a defined flow rate regardless of pressure variations of the water supply line. They can be inserted directly into most fixed showerheads, handsets or basin monoblocs. A guide to specifying sustainable architectural aluminium glazing systems for the new-build and renovation residential market has been launched by Kawneer. The 20-page brochure articulates the results of the manufacturer’s recent period of significant investment in new product development to meet the residential sector’s increasingly stringent project requirements in terms of sustainability, performance and compliance. 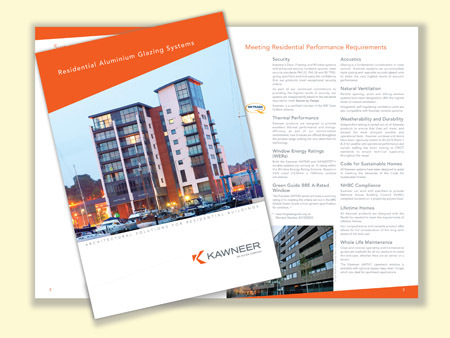 It details how Kawneer’s residential portfolio meets a plethora of performance requirements such as security standards, A ratings with the WER (Window Energy Rating) and BRE Green Guide schemes, Code for Sustainable Homes, acoustics, natural ventilation, weatherability and durability, NHBC and Lifetime Homes compliance. Window products that feature in the guide include the AA540 series of casement, horizontal and vertical pivot and tilturn windows which is BRE Green Guide A-rated, and the AA600TE series which also offers a new parallel opening window for exceptional levels of natural ventilation. Sliding window and door systems designed for the residential market include the AA3110 sliding window and door and the high performance AA3572 lift slide door, while the AA540 and AA600TE swing, tilt slide and tilturn doors suite with the standard window configurations to provide ideal glazing solutions for apartments. Entrance and framing solutions featured in the brochure include the 451PT integrated framing system for entrance and communal areas and the series 190 narrow-style and 350 heavy-duty door systems. Also featured in the brochure are the zone- or mullion-drained AA100 (50mm sightlines) and AA110 (65mm) as well as the AA201 unitised curtain wall system, alongside the AA100 Firescreen fire-rated curtain walling. The guide also features the Kawneer AA130 Brise Soleil system along with specially designed connection brackets to integrate with the curtain walling systems and AA600TEPlus windows. The Solar-Line Solar Outlet from Klober is being used as part of the installation of photovoltaic panels on 1200 new homes being built by Alliance Homes. The housing association is placing heavy emphasis on renewables to help meet carbon reduction targets and the Solar Outlet creates the all-important watertight seal around cables as they pass through the roof. Brio Dry Floor Screed is suitable for new-build or refurbished residential and commercial buildings, and, claims Knauf, offers advantages over traditional wet screeds and timber decks such as better stability, the speed and ease of installation, and higher quality. This gypsum fibre board is virtually thermally transparent, allowing it to work well with underfloor heating systems, offering responsive heating at low running cost and with lower CO2 emissions. Knauf Brio has a thermal conductivity of 0.38 W/mK. 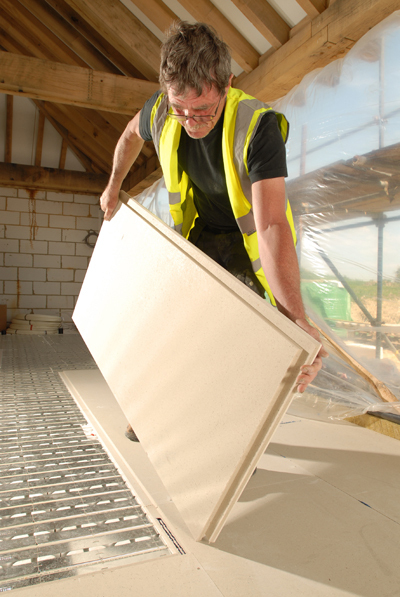 The panel is also ideal for refurbishments because of its low installation thickness of just 23mm, which allows for the installation of an underfloor heating system for a total loss in room height of just 50mm. Knauf Brio is also much lighter than traditional wet screeds, significantly reducing loads and costly structural requirements in multi-storey buildings. There are four Knauf Brio boards: Brio 18 (18mm thick), Brio 23 (23mm – recommended for underfloor heating applications), Brio 18WF and Brio 23WF. The Brio WF (wood fibre) products are specifically developed to be an effective floor treatment as part of an acoustic separating floor, and an instant upgrade in refurbishments. They are composite boards with an additional 10mm laminated wood fibre layer that provide high mechanical load resistance and effective footfall sound insulation and remove any need for acoustic battens. Installation requires no special skills. The precise tiered edges are glued with Knauf Brio Joint Adhesive and then screwed together to ensure a solid bond. Once the glue has hardened the new floor is ready to take traffic – typically a matter of hours. All Brio boards are non-combustible and classified as Building Material Class A1. Wavin has launched Recycore Technology; a new manufacturing process developed to reduce the use of virgin materials by using at least 50% recycled content. It has been designed to help customers meet tough new environmental commitments, achieve a lower carbon footprint and improve their sustainability credentials. Wavin is already one of the biggest European users of recycled plastic and, with the introduction of Recycore Technology, the company expects to take many more thousands of tonnes out of the waste stream. Recycore Technology enables Wavin to use as much recycled material as possible, yet ensuring the same high performance and handling characteristics that customers of its virgin products have come to expect. This reflects the growing consumer demand for more sustainable solutions and greener products, that is, ones that can be more easily recycled or are themselves made from recycled materials or, better still, a combination of the two. Recycore Technology products are tested to industry standards and, where applicable, will be third party approved, through schemes such as the BSI Kitemark. 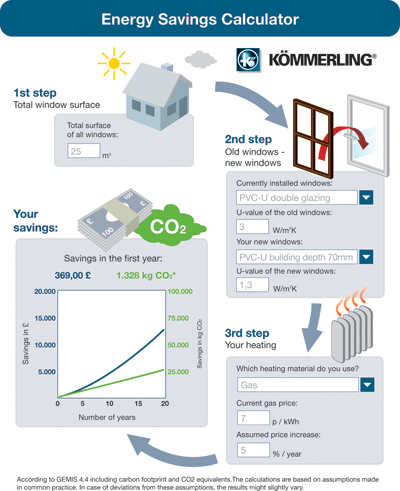 Kömmerling has launched an energy savings calculator to its website, which enables consumers to estimate the cost and carbon dioxide savings of installing certain types of window including 58mm, 70mm and 88mm frames. The energy savings calculator takes into account the total window surface area, type of windows to be replaced, proposed new windows and estimates their U-value. Once this has been established then users can input their choice of heating material used and the price per kilowatt, the calculator then adds a nominal annual price increase. The results are then calculated showing the savings in year one in terms of money and carbon dioxide reductions and this is then extrapolated over 20 years. 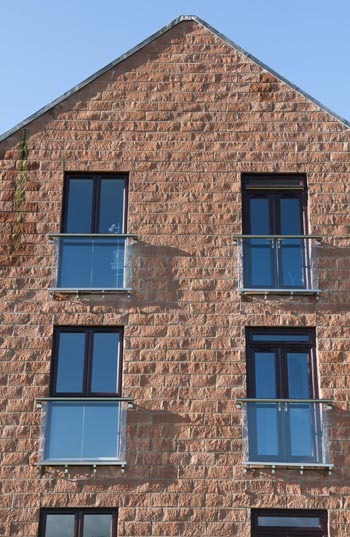 A typical house with 25m2 of glazing with first generation PVCU double glazing upgrading to a new five-chambered Kömmerling C70 or O70 Gold system would make significant savings, with the resulting reduction of over one tonne of CO2.